This mixed-used building in Kenmore offers eight 2-bedroom apartments, occupying two floors, above an open commercial ground-level floor. The full program and narrow property required careful siting of both buildings in order to engage the street and provide access across the site. To break down the mass of the front building, the design featured a series of floating planes that were constructed of different materials as well as keeping the corners open for balconies. 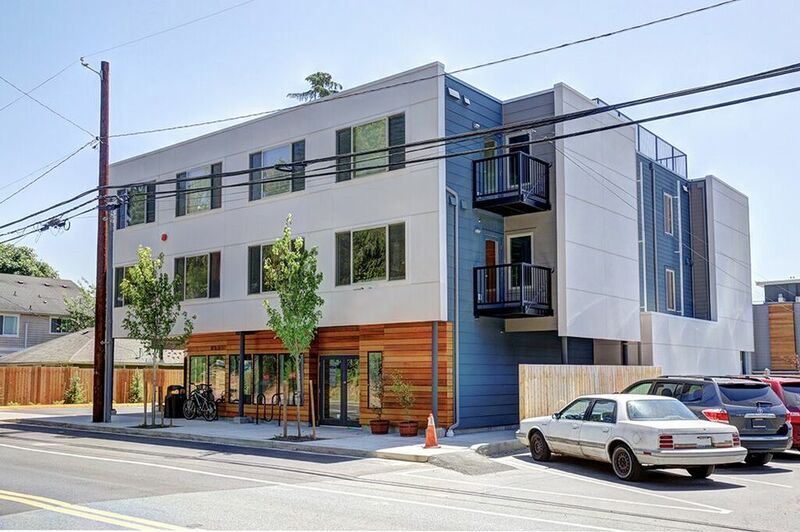 Four 3-story town homes were designed behind the front building, each with a rooftop deck with sweeping views of Lake Washington. The ground floor of the main building is recessed from the building face to provide a covered walkway for visitors, and is clad in warm, inviting stained wood. Pedestrian accouterments, like planters and bike racks, serve to help active the ground floor and tie it into the existing street front.